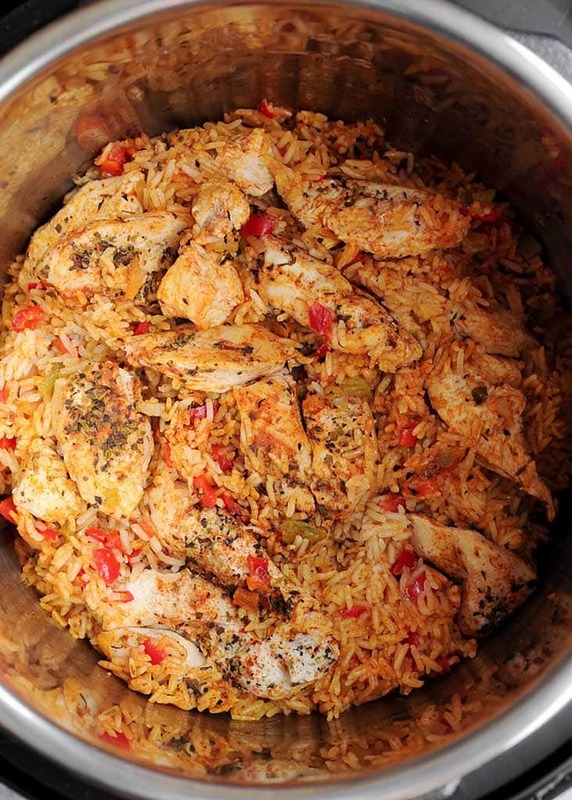 Cajun Instant Pot Chicken and Rice - What's In The Pan? I’m constantly blown away by my pressure cooker and what it can do in such a short amount of time. It’s amazing! No wonder that my slow cooker is gathering dust in the corner. Because this instant pot chicken and rice recipe won’t disappoint! 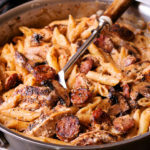 This pressure cooker recipe is one of my favorite one pot meals made in the Instant Pot. Everything for a hearty meal ready in less than 30 minutes. I was sitting around reading the Instant Pot recipes and contemplating what to try next when my husband suggested Cajun chicken and rice. We gave it some thought. 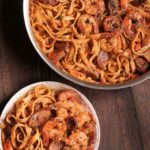 Should we try Cajun Instant Pot recipe? First of all, we love Cajun. We could eat it for breakfast, brunch, lunch, and dinner. Not kidding. Secondly, we love spicy food. Better to overload on Cajun spice, than salt, right? At least that’s what my husband always says. Finally, spicy chicken and rice is a match made in heaven. Or, in the instant pot? Being prepared is as important as cooking process itself! We want to add everything into the pot as quickly as possible. Do you know why? Because we want to avoid any liquid from evaporating too fast. And too soon! This is what will help us avoid the dreaded BURN warning. First things first, I want to make sure that you have followed all of the steps below. Before you start making Instant Pot Chicken and Rice. You should take chicken stock out of the fridge ahead of time. This will bring it to room temperature. If cold liquid hits the hot pot, liquid will evaporate too quickly. Next, measure out tomato paste and chicken broth. Make sure to use either Jasmine or Basmati rice. 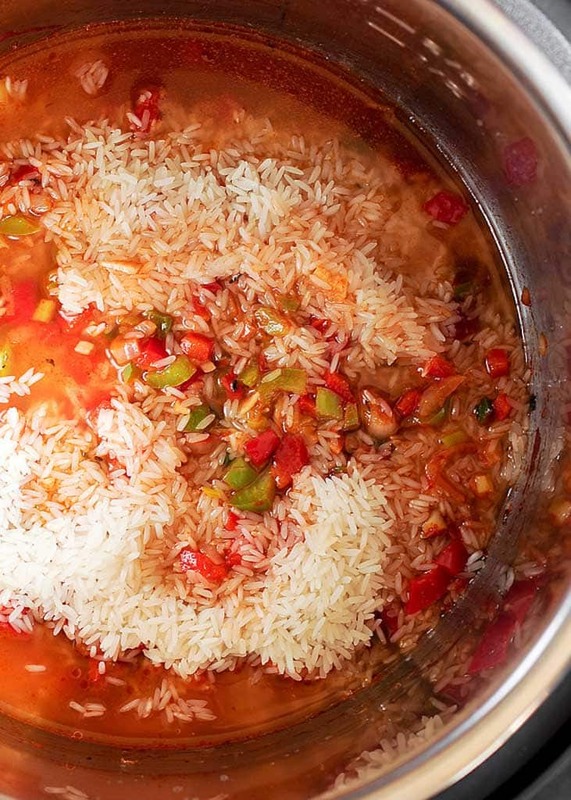 While pressure cooker jasmine rice is very aromatic, basmati rice is no less flavorful. They won’t become mushy or burnt. Perfect instant pot rice choice! Also measure out the rice and rinse it. I usually rinse the rice 3-4 times to get rid of starch. Doing this will help prevent potential Burn notice. I like to have olive oil, spices, salt and pepper right in front of me. Chop the veggies. Garlic, bell peppers, and scallions. Finally, slice the chicken ahead of time. Which buttons do I need to push? First things first, close that lid and lock it. Next, move valve on top of the lid to Sealing position. This will ensure pressure building up inside. Push Pressure Cook button on the front panel. This button is also called Manual on some models. At this time the pressure will start building. This is called preheat mode. Once the instant pot is getting close to reaching its optimal temperature, you will see steam coming out of the float valve. And very soon, the screen will show “On” for the duration of the preheat mode. 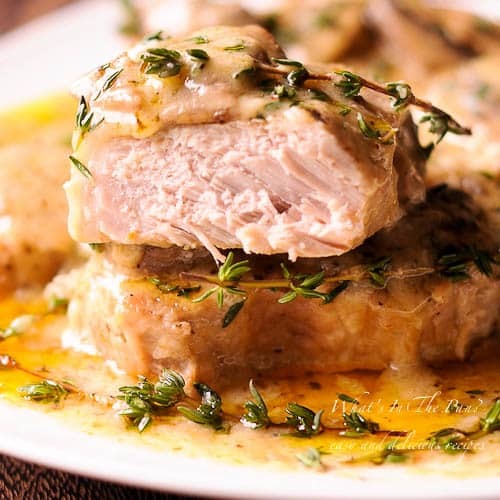 You should remember that the time it takes to cook the recipe, is not the total cooking time. You need to give the pot some time to ‘come to pressure’, and the more water in the pot, the longer this will take. Don’t worry, just let it do it’s thing! You will know when the preheat mode is over when the float valve pops up and seals itself. The steam will stop coming out. At this time you will hear the beep as well as the On on the screen will disappear. The digital display will start the countdown. 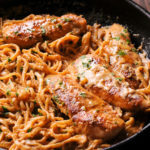 Now all you have to do is patiently wait for your Cajun Instant Pot Chicken and Rice to be done. How do I know if Instant Pot Chicken and Rice is done? Once the countdown is over, the instant pot will beep several times. That means it’s time to use a 10 minute natural pressure release method. First, put the wet towel over the lid. Next, move your face and body away from the lid. Finally, move the valve from Sealing to Venting. If not using a towel, you will see a straight line of steam shooting vertically from the lid into the sealing, which perfectly normal. Please make sure to wait until all the steam is out. Once the red pin drops, open the lid. Take the chicken out and shred the chicken strips with the fork and stir to combine with the rice. Taste Instant Pot Chicken and Rice and adjust the seasoning at this point. I wrote this Cajun Instant Pot Chicken and Rice recipe for white rice. If you decide to make it with brown rice, the instructions are slightly different. You will need to add more time and more liquid. You should use 2 1/4 cups of ROOM TEMPERATURE BROTH for 1.5 cups of brown rice. Cook on Manual, set to High pressure for 15 minutes. When time is up, let the pressure release naturally for 10 minutes. After that release remaining pressure by turning the valve to ‘Venting’. If you are frequently using your Instant Pot for a variety of recipes, it’s a good idea to have 2 different rings. One for savory recipes, and the other – for sweet recipes. This will help in avoiding odor exchange. I use this Genuine Instant Pot Ring as my second ring. It has over 1,000 positive reviews on Amazon. Instant Pot Tempered Glass Lid is a good way to help keep the food warm. You don’t even have to put the heavy pressure lid on! Yes, you can double Instant Pot Chicken and Rice. Doing so does not change the cooking time. One cup of rice will take same amount of time to pressure cook as will two cups of rice or three cups. However, make sure to not fill the instant pot more than half full for rice. That is, NEVER bring food over the maximum full line. This is especially important when rice is concerned. 1/2 full is your maximum here. Hungry for more instant pot recipes? 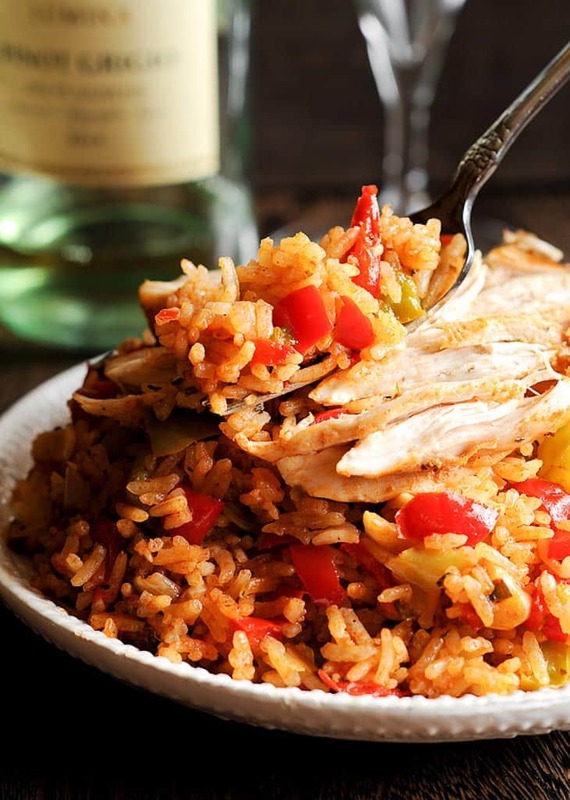 Chicken and rice are perfectly seasoned with Cajun spices and pressure cooked in the instant pot together with chopped bell peppers, scallions, garlic and shallots. Preheat Instant Pot by pressing the "sauté" button. Sautéing Veggies: Once IP is hot, add olive oil and then add chopped shallot, red and green bell peppers, scallions, garlic and sauté for 2-3 minutes. Deglaze: MANDATORY STEP! Next add 1/4 cup of chicken stock to deglaze the bottom of the Instant Pot, making sure no bits and pieces are stuck to the bottom. This will ensure that nothing is stuck on the bottom to prevent BURN Warning. DO IT VERY WELL - BE GENEROUS WHEN DEGLAZING. Next add remaining chicken stock, tomato paste, Cajun seasoning, onion powder, garlic powder and sea salt. Mix and stir to combine and to make sure nothing is stuck to the bottom. Now add rinsed rice and make sure it's submerged into the liquid. 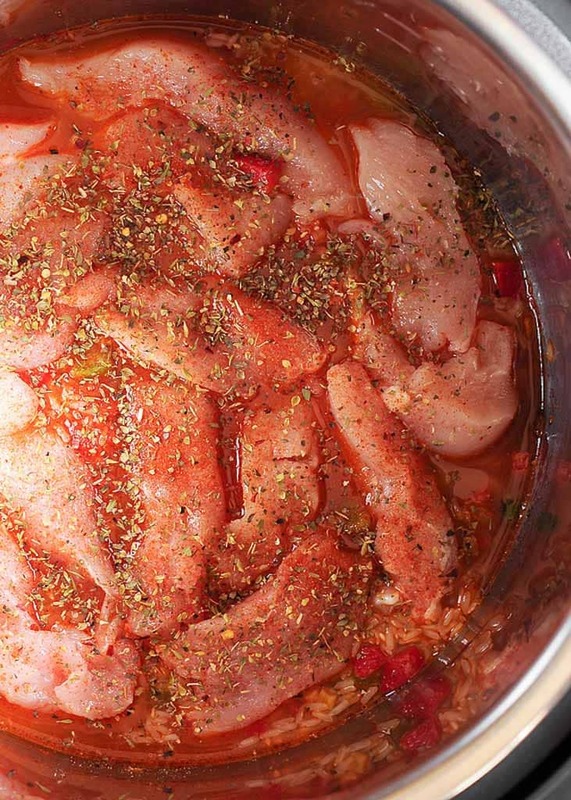 Add sliced chicken and season it generously with salt, pepper, Cajun seasoning and Oregano (or Italian Seasoning) right in the pot. Then IMMEDIATELY close lid (IMPORTANT!) to avoid water from evaporating. Lock the lid and put valve to Sealing position. Push Pressure Cook (this button is also called Manual on some models), set to High Pressure and set the time on the digital display for 8 minutes. Pressure Release Method: When the time is up, use 10 minutes of natural pressure release: put the wet towel over the lid, move your face and body away from the lid and move the valve from Sealing to Venting. If not using a towel, you will see a straight line of steam shooting vertically from the lid into the sealing, which perfectly normal. Wait until all the steam is out and until the red pin drops, then open the lid. Shred the chicken strips with the fork and stir to combine with the rice. Taste an adjust the seasoning at this point. If it takes long time to come to pressure, you might get a Burn notice. In that case, open the lid (put the wet towel over the lid, move your face and body away from the lid and move the valve from Sealing to Venting) and check the rice - it should be done by this point. You mention using NPR. Natural pressure release means that you leave it alone and let the pin drop on its own. Do we do that or open the valve to venting like you described? Once you hit 10 minutes, open the valve and vent. Sorry if it was confusing. Thank you! I made it and it was wonderful. So much flavor infused into the dish. So happy it turned out well! The blog post with step by side directions and tips were so helpful, along with the video! 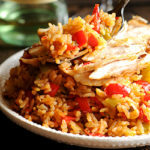 Did not get a burn notice and wow – the basmati rice was so delicious and fluffy! Definitely appreciate the guidance in making this dish. One of the most helpful recipe blog post I have came across! This dish is definitely oneI will repeat again! Kristina, thank you so much for such kind words! Followed the instructions, except using chicken thighs instead of breasts. It was perfect! Basmati rice was delicious. Cool time was perfect. Thank you Stephanie for sharing your results! I’m glad it didn’t burn. I just made this tonight. I saw the previous comments about the rice turning out hard. So I googled how long rice takes in the IP and changed the cook time. I followed the directions exactly EXCEPT, instead of 8 minutes, I put mine on for 12. Still did the 10 minutes NR at the end. It turned out wonderful. Very delicious. What size pot do you have? 8 quart one? Is it a newer model? I’m glad it worked! This seems like a really long time to be cooking the rice! I make instant pot rice all the time with 6 minutes of cooking time. I make a chicken biryani that cooks in 6 minutes too or else the rice is mush. To make sure the chicken is cooked you can saute it a bit when doing the vegetables. I really like the look of this, but I think I’m going to start with a short cook time and then add time if needed. Yep, I followed the instructions and it was awful. All mush! I just responded to someone who said their rice was too hard. I’m perplexed at such different results. I want to collect more information to compare the results. If you come back on here – can you leave a comment with the type of rice used?